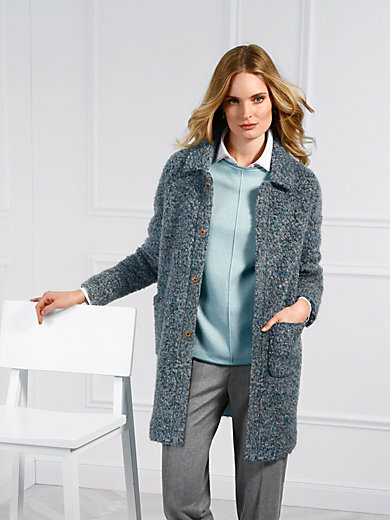 Long jacket by Basler: soft, cosy and highly fashionable! Comfortable design in multicoloured bouclé knit with collar band in a contrasting colour, concealed press stud fastening with stabilising corded ribbon trimming plus 2 patch pockets. 35% acrylics, 21% mohair, 21% alpaca, 17% wool, 6% nylon. Lining 94% polyester, 6% elastane. Length approx. 34ins. The long jacket should be dry cleaned.